Members of executive of the Nigerian Institute of Landscape Horticulture (NILH), have described the University’s landscape as very beautiful and have, therefore, indicated their interest to partner with the University in achieving the Institute’s certification programme. Speaking during a courtesy call on the Vice-Chancellor, Professor Olusola Oyewole before the National Executive Council meeting of NILH, held recently in the University, the President of the Institute, Mr. Fatai Amodu, said the certification programme entailed that members of NILH, who wished to migrate from one class of membership to another wrote a qualifying examination. But with the while existing facilities on ground in FUNAAB, such as Information and Communications Technology (ICT), as well as experts and personnel, the University was better positioned to partner with the Institute in running the certification programme successfully. According to him, “the Institute regulates the practice of the landscape horticulture profession in Nigeria and as a policy; NILH works with Institutions because it is the kitchen for cooking professionals, as we have graduates of horticulture, graduates of agriculture and graduates of plant science. They are potential members who would find a very rewarding career in landscaping horticulture”. 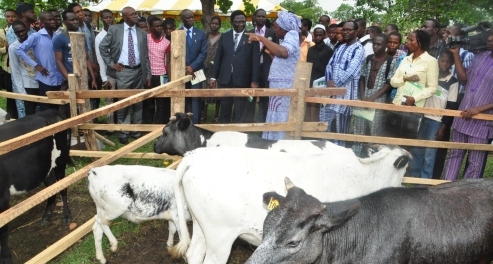 Corroborating the President, the Secretary-General of the Institute, Mrs. Lydia Halim, said that the Institute intended to have a domicile Secretariat in FUNAAB and partner the University in the area of manpower development, so that committed practitioners, who were in the field, would acquire the necessary competence to be exceptional professionals. On the expectation of the Institution, the Secretary-General said, “the expectation of the institute is high, as I was in FUNAAB about six to seven years ago, and I can say confidently that what I am seeing here is not what I met then. You have grown and you have also exhibited competence in what you are doing, so it makes sense to tie our boat on the winning side”. 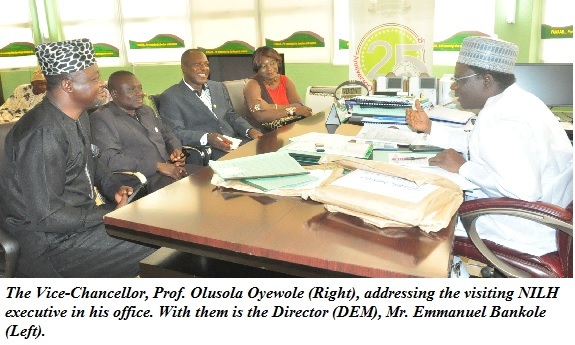 Earlier, the University’s Director of Environmental Management Unit, Mr. Emmanuel Bankole, solicited that the University should approve the proposal, stressing that “FUNAAB is very lucky because two other Universities are being considered for this programme but what we have on ground has been able to speak for us and I see it as an opportunity that we must lash unto, particularly, the students that we have. It is going to go a long way to help them unlike the students elsewhere. They would have the opportunity of coming in as student-member and be exposed to practicals”. Responding, the Vice-Chancellor, Professor Olusola Oyewole, stated that FUNAAB was committed to any activity that was geared towards the advancement of the Institution, its work force and the community in general. He encouraged NILH to write to the University formally, to state its request, while assuring that the University would be interested in assisting the Institute in the development of its curriculum.